Papercrafts are objects made of cardboard and found within Mario & Luigi: Paper Jam. Toadette with the help of Paper Toads creates the hero version, while Paper Kamek is the only one who says anything about creating the other versions. The hero versions are used by Mario, Luigi and Paper Mario and carried by Toads; which serve as the counterpart to the Super Bowser battles from Mario & Luigi: Bowser's Inside Story and its remake and the Giant Luigi battles from Mario & Luigi: Dream Team. Toadette and Paper Toads can be heard creating the papercrafts in the workshop at the castle. The enemy versions aren't piloted by anyone, but the boss versions are. Both are carried by various non-paper enemies except during the credits. There are a total of five papercraft bosses, and twelve papercraft enemies, in the game. With each boss having its own arena during papercraft battles. Each of Toadette's five papercrafts are used only once, each in a different battle respectively. The four Papercrafts made by Toadette at the end of the credits. Toadette builds a total of five papercrafts throughout the course of Mario & Luigi: Paper Jam. They are, in order; Mario, Luigi, Peach, Yoshi, and Fire Mario. With the exception of Mario, each papercraft has a unique trait that it can use in battle. However, every hero papercraft can turn 180 degrees when the player presses and move the camera to the direction they are facing using and can do both at the same time. They can dash with and be thrown with . Each papercraft has their own theme when they charge. Enemy papercrafts don't charge, making hero papercrafts vulnerable during this time. Charging is done with . 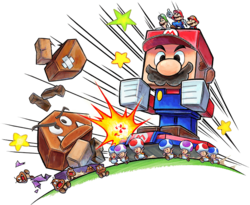 Papercraft Mario is the first papercraft to be built by Toadette for the trio to use. After she studies the Papercraft Goomba that the Goombas dropped at the entrance to Doop Doop Dunes, she creates a papercraft of Mario with the help of Paper Toads from Sunbeam Plains. It is used in the battle against the two types of Papercraft Goombas and Papercraft Megacrinkle Goomba. Its charge music is "Mario Craft Rhythm". Papercraft Mario is also seen in Super Mario Maker for the Mario Trio Mystery Mushroom costume when the player presses . Papercraft Luigi is the second papercraft constructed by Toadette. It is utilized in the battle against Papercraft Kamek in Doop Doop Dunes. This papercraft features a hammer that allows it to jump on spiked papercraft enemies, like Pokeys. After the Papercraft Pokeys are defeated, Paper Kamek and Kamek battle the trio with a papercraft in their own likeness. Its charge music is "Luigi Craft Rhythm". Papercraft Peach is the third papercraft used by the trio. It is featured in the battle against Papercraft Bowser Jr. at Mount Brrr. Papercraft Peach has a parasol, allowing it to float in the air when thrown. The papercraft can add more damage if they press above an enemy. It also holds its parasol in front of itself when it dashes, allowing it to deflect enemy projectiles. Its charge music is "Peach Craft Rhythm". Papercraft Yoshi is the fourth papercraft to be utilized by the trio. It is used to battle Papercraft King Boo at Bowser's Castle. It can perform a ground pound which can stun enemies and activate buttons, and its long tongue can grab distant objects; such as poles, which lets it cross lava, and enemy papercrafts, letting it attack floating enemies. Its charge music is "Yoshi Craft Rhythm". During the credits, it is piloted by Toadette. Papercraft Fire Mario is the fifth and final papercraft to be built by Toadette. It is constructed using Fire Ore found in Neo Bowser Castle, and is used to battle Papercraft Bowser. Unlike the other papercrafts, Papercraft Fire Mario can shoot fireballs with , which it can utilize as an alternate method of attack, allowing it to hit far-off enemy papercrafts. Its charge music is "Fire Mario Craft Rhythm". It is the only papercraft to not be seen during the credits. The Papercraft Megacrinkle Goomba is the first papercraft boss faced by Mario, Luigi and Paper Mario. It is piloted by a Paper Goomba, and has no special talents or abilities. It is encountered and fought in Sunbeam Plains, with Papercraft Mario being used in the battle against it. Regular-sized and small Papercraft Goombas are also encountered in the battle. Its name is a likely a reference to the Megasparkle Goomba encountered in Paper Mario: Sticker Star, and the crown found on its head resembles the first Royal Sticker from the game. Papercraft Kamek is the second papercraft boss fought by the trio. It is piloted by both Kamek and his paper counterpart, who both complain on how ugly it is. Papercraft Kamek features a magical shield that prevents the player from rushing into it, as well as damaging Papercraft Luigi. The trio must wait until the shield disappears for a short time after the papercraft teleports or uses certain attacks before attempting to damage it. It is fought in Doop Doop Dunes, and is accompanied by Papercraft Goombas and Papercraft Pokeys. Toadette's Papercraft Luigi is used to battle it. Papercraft Bowser Jr. is the third papercraft boss encountered by the trio. It is piloted by both Bowser Jr. and his paper counterpart, who use it to have fun. Unlike the previous papercrafts, it has a spiked shell and also runs a lot faster. It is encountered and fought at Mount Brrr, accompanied by several Papercraft Mechakoopas and Papercraft Spikes. Papercraft Peach is used to fight this papercraft. It has three phases. In the first phase, it attacks by turning around and hitting Papercraft Peach. However, the player can use this to attack Papercraft Bowser Jr. In the second phase, it covers up the spikes with snow and attacks with Papercraft Koopa Shells. In the third and final phase, it places Papercraft Bob-ombs, but the player can use these to stun Papercraft Bowser Jr.
Papercraft King Boo is fourth papercraft boss that the group face. It is piloted by Morton and Lemmy, and floats in the air as a result of it being carried by Boos. It is encountered and fought in Bowser's Castle, joined by many Papercraft Dry Bones, Papercraft Boos, and Papercraft Goombas. Papercraft Yoshi fights this papercraft, and must use its tongue to pull the papercraft close before it can attack or wait until Papercraft King Boo tries to slam the player and miss. The papercraft can also roll around the place before doing this. Papercraft Bowser is the fifth and final papercraft fought by Mario, Luigi and Paper Mario, and is claimed to be the ultimate Papercraft by the Bowsers and Kameks. It is piloted by both Bowser and his paper counterpart, and, similarly to Papercraft Bowser Jr., has a spiked shell on its back. It is encountered and fought in Neo Bowser Castle, and is preceded by a gauntlet containing all four papercraft bosses before, all without a pilot except for Papercraft Kamek. Papercraft Fire Mario is used by the trio in the battle against this papercraft, and must use its fireball to stun Papercraft Bowser before it can damage it. It also has many attacks: it can turn around and use its spiked shell to damage Papercraft Fire Mario, it can breathe fire from the center, and it can go inside his shell and either move back and forth or start in the center and circle outwards. The Papercraft Goomba accompanies Papercraft Megacrinkle Goomba, Papercraft Kamek, and Papercraft King Boo. It also guards Doop Doop Dunes until after the Papercraft Megacrinkle Goomba battle. Their attack is to simply ram into the player, but can be defeat by jumping onto them after a stun. Smaller Papercraft Goombas exclusive to the Papercraft Megacrinkle Goomba battle are the weakest enemy papercraft and can be defeated by a simple dash and always appear in groups. The Papercraft Pokey accompanies Papercraft Kamek. It harms the papercraft if the player attempts to dash into it, simply because it has spikes. Papercraft Luigi's hammer can safely damage a Papercraft Pokey. The Papercraft Spike accompanies Papercraft Bowser Jr. They can also be summoned by him. They throw papercraft spike balls which can damage the player on contact. Papercraft Peach can deflect the spike balls with a parasol. These can be directed at Papercraft Bowser Jr. to stun it. A Mechakoopa Papercraft next to Papercraft Bowser Jr. The Papercraft Mechakoopa accompanies Papercraft Bowser Jr. They follow the player for a short distance, but otherwise can't attack. The Papercraft Koopa Shell accompanies Papercraft Bowser Jr. They are shot after the aforementioned papercraft loses a third of its HP, but before it has accumulated damage consisting of more than two thirds of its HP. They can bounce off walls a few times before they are destroyed by the walls. The Papercraft Bob-omb accompanies Papercraft Bowser Jr. It remains still until the player dashes into it. If it explodes, it can deal a little damage to either papercraft. The Papercraft Dry Bones accompanies Papercraft King Boo. They try to crowd around Papercraft Yoshi, making them unable to attack other enemies until they are defeated. If they fall into the lava, they fall over and are easily attackable. The Papercraft Boo accompanies Papercraft King Boo. It must be grabbed by Papercraft Yoshi to damage it, as it sometimes floats around lava. However, since they circle around Papercraft Yoshi, the attack may miss. They can also throw themselves. The Papercraft Whomp accompanies Papercraft Bowser. Just like a regular Whomp, it tries to fall onto the papercraft. It takes two throws to defeat the Papercraft Whomp. The Papercraft Airship accompanies Papercraft Bowser. It shoots the Papercraft Bullet Bills either straight or in diagonal patterns. It can stop attacking if Papercraft Fire Mario shoots it with a fireball. It takes two throws to defeat the Papercraft Airship. The Papercraft Bullet Bill accompanies Papercraft Bowser. One can be seen before the papercraft battle as a threat to the trio. They come from the Papercraft Airship during the battle. This page was last edited on February 27, 2019, at 16:03.